The Sai revolution is a silent one. It does not sweep one off their feet; it actually ensures that one's feet are placed firmly on the ground. It does not come as a thunder from the vast skies; it breezes as a soft whisper from within. It does not move across lands like a conquering army; it merely sprouts like a tender sapling and grows into a mighty tree! And Swami, the divine gardener, just invests in "seeds" and more seeds! One part of this revolution is happening in the city of Hyderabad in Andhra Pradesh. The Sai Youth, by practice and precept, have shown to thousands in this city the way to enrich their lives, making them more meaningful. 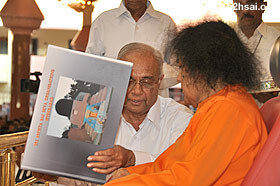 As a result of these seminars and service activities, more than a thousand inspired youth made the pilgrimage to Puttaparthi to have the darshan of Swami. 1100 youth were thus the audience to inspiring talks by the venerable Prof. G. Venkataraman and the All India President, V. Srinivasan in the Poornachandra auditorium in the afternoon. For the evening, Swami had permitted the youth to put up a drama “Namami Bharateeyam”. 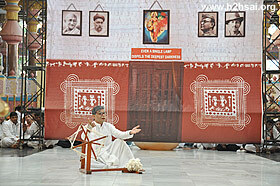 By 4:30 p.m., the backdrops were ready and a contingent of Veda chanting youth were waiting at the divine residence. It was at 5:10 p.m. that Swami arrived. He blessed the poornakumbham and flagged the Vedam procession to begin. Bhagavan then followed and as has become the practice of late, threw vibhuti packets to those devotees whom He knew needed it. As soon as He passed across the ladies' side, He cut and moved towards the interview room. Taking a round in the veranda, He arrived on the stage. The Veda chanting was on and once Swami told the programme to begin, it was stopped. The youth coordinator prayed to Swami for blessings and various members came forward to show Swami cards which contained the work they were doing. Swami blessed them all and finally the drama began. The presentation started with two commanders from the army lamenting to their grandfather about the state of affairs in India today. They use the example of one student to depict how people are ready to go abroad and do even menial jobs as being abroad is considered prestigious. The grandfather narrates anecdotes from the freedom struggle, reliving the inspiration and patriotism of the times. The discussion meanders about Values and finds fulfillment in the faith that Sai is here to lead the youth. 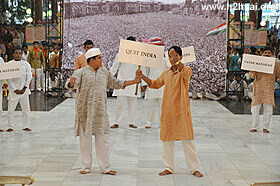 The drama was interspersed with patriotic dances and quotes from Swami, and lasted about 45 minutes. Finally, all the participants made a formation. 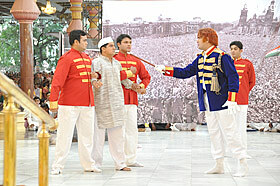 Swami asked whether the programme was over before moving down the ramp. The youth had organized themselves wonderfully in a disciplined manner. Swami posed with all the actors. Then one of the coordinators asked Swami whether the dancers too could take a picture with Him. He agreed and the dancers came ahead. After those pictures were taken, Swami moved back up the stage. 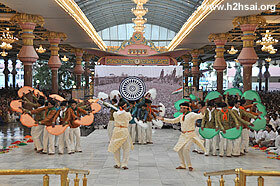 He blessed prasadam to be distributed to all as instrumental patriotic music from the PA system filled the air. Swami asked the students to sing bhajans and slowly the youth who had come first time to Swami also began to participate. Swami now asked for the famous alaap bhajans. As these were sung, the clapping and decibel levels went high. The bhajans after them too seemed to benefit from the enthusiasm that had been generated! 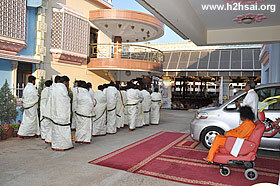 After a few more bhajans, Swami received aarthi and retired for the day.